Selle Italia are one of the big names in saddles, with a long history. The Novus originally dates from the 90s and boasted "engineering by Ferrari", no less. It's back, in a couple of versions that share the basic shape of the original but with newer construction techniques. It's a welcome return because it's a handsome and – more importantly – comfortable saddle. This Kit Carbonio version is slightly lighter than the Flow model we reviewed recently, which had titanium rails and a lower price tag. The Kit Carbonio designation originally meant (back in 2003) that the saddle rails were made from vanadium-titanium alloy with a braided carbon fibre layer over the top, but nowadays the rails are Carbokeramic, a high-modulus carbon fibre with a resin containing ceramic particles. I can't tell you what role those ceramic particles play, but the resulting characteristics are good. Some saddles with carbon rails can be harsh and inflexible, but the Novus has enough give to make it a comfortable place to spend several hours. It helps that there's well-positioned padding, which is firm but with enough give to prevent your sit bones getting sore. The shape isn't dramatically different to other saddles, with a central cut-out intended to relieve pressure down there. 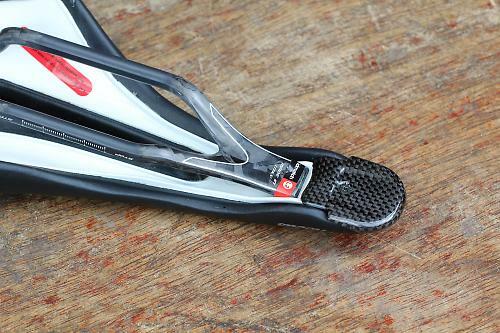 The nose of the saddle tapers downwards, and Selle Italia say it is shaped to "help the rider move forward in order to achieve on optimum riding position". I can't say I really noticed the effect of the taper. As well as a change to the rails, there is more carbon fibre around the extremities of the saddle, visible at the front and around the back of the saddle. This doesn't appear to be structural as it's thin and quite flexible, but will help to prevent premature wear in these areas. The downside is it's prone to scratches – particularly an issue at the widest point of the saddle, the part that tends to come into contact with walls when you lean your bike up. Like the Novus Flow, there are two sizes of Kit Carbonio available, and Selle Italia have developed a system called idmatch for determining which suits you best (as well as which of their range of saddles are most likely to be comfortable for a particular cyclist). The system uses some key biometric measurements as well as details of the type of riding. I didn't have the chance to test this system, unfortunately, although it's available at their dealers worldwide. Saddles are a personal thing and what suits one rider can be agony for another; the idmatch system sounds like a useful means of reducing the guesswork. Weighing in at 200g, it's a fairly light saddle. That said, for a carbon-railed model at this price point it isn't the lightest available – there are plenty available between 150g and 200g. If weight is your primary concern (and budget most definitely isn't), Selle Italia have the SLR Tekno, which manages to get down to half the weight of the Novus by the cunning technique of doing away with any padding at all. Tempted? I'm not. The top is covered by a material called Fibra-Tek which seems pretty hardwearing, and I found it allowed me to move around as I needed. You can get saddles designed with low-friction material for easy sliding around, while at the other extreme Prologo feature the tiny suckers of the CPC system, designed to anchor you in place. It's fair to say that there's no real consensus on how slidey you want your saddle to be, but Fibra-Tek worked for me. Those two slivers of carbon fibre on the top don't appear to do anything except look fancy – they're pretty flexible so they certainly don't contribute to the structure. Still, it's a good-looking design, it's well made, and I found it very comfortable. The only reason I'd hesitate to buy it is that the Flow model isn't that much heavier and it's a third cheaper. That's probably the one I'd opt for. 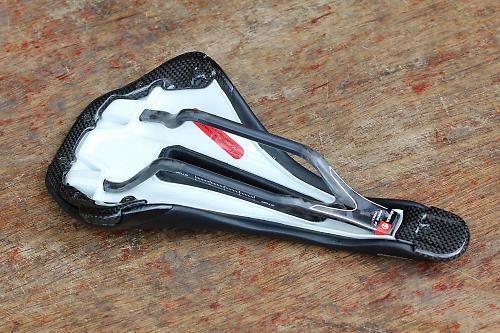 A re-born saddle from the 90s reappears in a brand new version. The saddle is shaped to help the rider move forward in order to achieve on optimum riding position. Our large version weighed in at 201g. It's by no means a heavy saddle but it is heavier than most at this price point. Not by an amount that would prevent me from buying it, but if you're weight-conscious it's something to bear in mind. My fussy posterior enjoyed this test very much indeed - even though I was meant to be assessing the saddle's performance, I kept forgetting about it, even on longer rides, and that's an unusual and very positive thing. It's an expensive saddle, no doubt, so value will depend on whether or not you get on with it. I did, so I think it's a fair price given the quality and weight. Very well - it was that rare saddle that you fit and then realise you've not thought about once during a ride. Decent combination of weight and comfort. That it got written off in a crash (which would have probably have done the same to any saddle short of a Brooks). American and Singaporean, for two I've actually lived in. Which I just know you'll be fine with.